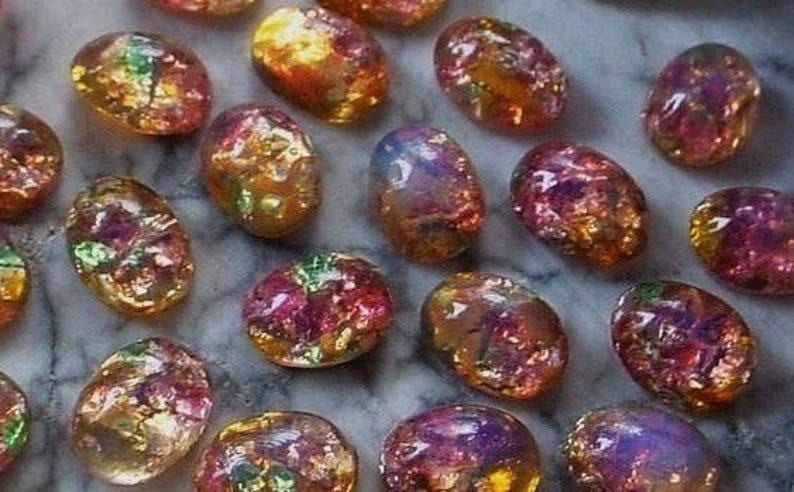 12PC OLD "MADE IN JAPAN" 8X6MM FIRE OPAL GLASS STONES. BOGO SALE! For a limited time, buy one lot of this item and I will automatically include another lot free with your order. Each stone unique & different. Unfoiled backs. Not 100% perfectly oval so they really have a hand made-lapped look. I would have loved to see how they made these. The foil colors are embedded in the stone and each is stone is uniquely different. Some have more of a pink tone, some an amber tone, still others a mix of pink, green and amber. Really nice stones. The stones you receive will vary from the photo but will a very nice assortment like those shown. I just randomly picked the stones shown in the photo and will randomly pick the stones you will receive. Don't worry, they are all nice! Due to age and handling you might find one or two stones with a edge ding or chip so I include 2 extra stones (just in case :). So you will actually receive 26 stones. These are small stones measuring 8mm in length by 6mm in width. Genuine vintage stones in excellent, never used condition.